852986 Crocodile Key Chain is a Creator Key Chain set released in 2010. The set features a Crocodile that is brick-built. The crocodile is made up of bright green, tan, and white parts. It is not a realistic model of a crocodile, but rather aims for a humanoid appearance. It is built on a 3X2 green plate, which also serves as the creature's feet. A sloped brick is placed directly atop the back edge of the plate, with two studs worth of length projecting from behind the crocodile, forming a tail. On top of the slope brick are placed three more bricks: a tan 1X2 (which would appear to stand in for the lighter coloured scales underneath a crocodile), and two sloped pieces placed sideways, making the creature's arms. On top of this layer are set two more plates, one a 1X2 directly atop it, and, on top of that, a 2X3 that projects in front of the model by a stud, forming the base of it's snout. On top of the snout's base are two green triangle-shaped slopes, which forms his nostrils. Behind these are two green 1X1 bricks printed with eyes, that finish the crocodile's face. On top of these is a 1x2 brick-with-railing, which attaches onto the keychain. It should be noted that as the model is glued together, it is technically one piece. This is a description taken from LEGO.com. Please do not modify it. (visit this item's product page) Take along a smile with a LEGO® crocodile! Take a bite out of your commute with the LEGO® Crocodile Key Chain! A cute charm for keys or backpacks! 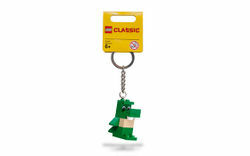 Facts about "852986 Crocodile Key Chain"
ShopDescription Take along a smile with a LEGO® crocodile! This page was last edited on 10 January 2016, at 00:03.